On March 26th, join WeWork and Survivor Denise Albert of The MOMS for this fun social mixer celebrating the #KomenCommunity! Several partners will be there with pop-up shops, helping us to #CreateMoreSurvivors! Denise Albert, 2017 Surviving with Impact Honoree, is an inspirational working single mom who has taken on all that comes her way with grace and poise. A tireless giver, Denise has long supported Komen Greater NYC. She is an award-winning journalist, television producer and Co-Founder of The MOMS (‪TheMOMS.com) and Mamarazzi Celebrity Events. Denise is a Former Senior Producer at Good Morning America, and Former President and Executive Producer at David Blaine Productions. She calls herself a #FulltimeWorkingStayAtHomeMom #HappilyDivorced “independent” mom of two boys. Denise is #FutureCancerSurvivor (and now #Survivor). She was the Co-Host of MOMS & The City on NBC’s Digital Television Platform and Co-Host of The MOMS on SiriusXM Radio and Mamarazzi on People.com. Adam Marc Jewels is a place to discover jewelry that will inspire and enchant you, from the simple to the extraordinary, every day. With one eye on street style and the other firmly on the most cutting edge gemstones and materials, Adam Marc Jewelry features a highly edited selection of the season’s most coveted jewelry designs. 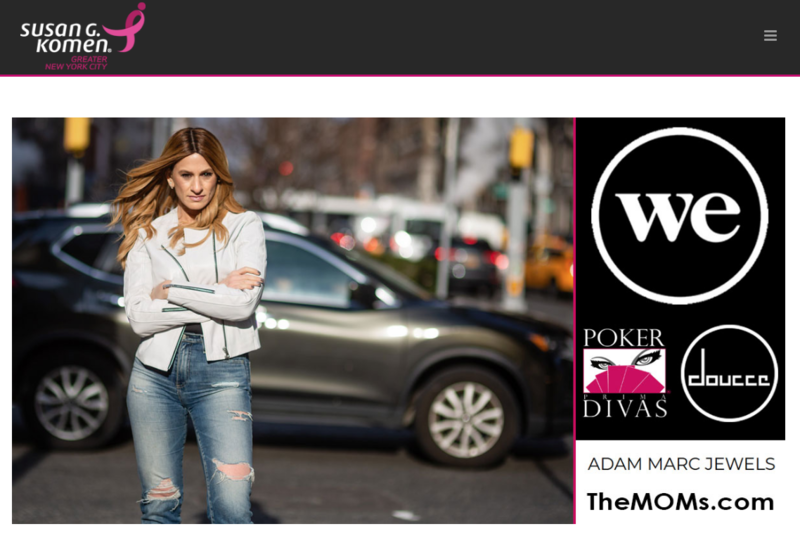 PokerDivas provides interactive, corporate events, women’s initiative and diversity programs, and executive training teaching assertiveness, leadership, and negotiating skills through the fun and excitement of poker. The company was founded by Ellen Leikind, a marketing executive with the Fortune 500, and author of POKERWOMAN: How to Win at Love, Life, and Business using the Principles of Poker. Women (and men) will learn everything they need to know at the poker table to be successful at the conference table.